` Vinyl liner swimming pools come in many shapes, colors and sizes. The thickness of the liner is also an important factor in cost and durability. The standard thickness of a vinyl liner swimming pool is 15-30 (mil) or gauge. Usually the thicker the gauge the longer the warranty and the more resistant to puncture or damage from the sun and or pool toys etc. You will probably expect to pay a little more for a heavier gauge liner but you should consider your lifestyle when choosing a vinyl liner thickness. If you have kids or pets that may be a bit rough on the pool then a more durable liner is probably in your best interest. You should also know that most manufacturers recommend that you never drain a vinyl liner swimming pool. This can damage the vinyl and make it brittle , crack or even shrink. In most cases the warranty will be voided if the pool is ever drained. AMS Financial can help you with all types of in ground and above ground vinyl liner swimming pool loans. 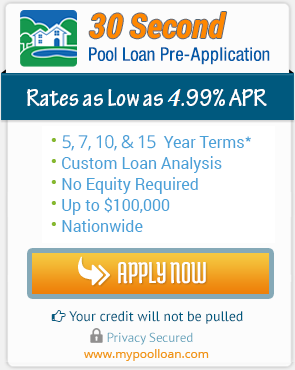 We even offer bad credit pool loans, so for less than perfect credit there may still be the possibility to finance your swimming pool.